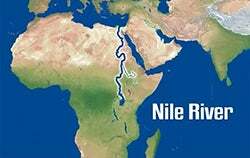 An Amazing Fact: Flowing 4,160 miles, the longest river in the world is the Nile. Its waters originate with Lake Victoria in Uganda, moving northward to terminate in Egypt at the Mediterranean Sea. On average, the river moves at an astounding 680,000 gallons per second; that’s over 10 million cups of thirst-quenching water every second! Did you know that the Nile flows through two thousand miles of scorching desert—yet everything around the river is green? One of my favorite Bible verses says, “Everything will live wherever the river goes” (Ezekiel 47:9). And through your gifts to Amazing Facts, you send a river of Living Water to millions thirsting for truth every month. 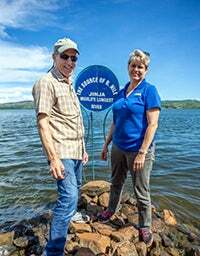 I recently stood with Karen at the headwaters of the Nile in the heart of Africa. 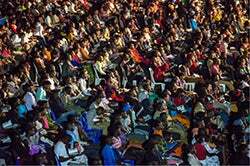 We were conducting evangelistic meetings in Uganda—an outreach you made possible—and we saw thousands drinking in the Bible truth! Victor’s young parents first tried to abort him—then when he was just two years old, they abandoned him. He never experienced the genuine love of a mother or father, and his early life was heartrending. As a young adult, Victor studied different religions hoping to find purpose and belonging. He studied with Mormons, Evangelicals, Catholics, and even Muslims. Then one day, he ran across the works of Anton LaVey, the founder of the Church of Satan. He even read the so-called Satanic Bible. ...when he was just two years old, they abandoned him. Victor was convinced that this contained the keys to power and happiness in this life; he even started a club dedicated to LaVey’s teachings. It breaks my heart that so many like Victor are looking for satisfaction in the vilest of places. We know they’ll never find peace drinking from the poisonous fountains of this world. 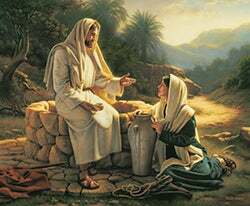 You and I know that Jesus is the Living Water, but the vast majority are still guzzling down deadly water. They don’t know where to find the Source of life, which is why we must point the way. We can lead them to Christ, the Spring of Eternal Life! Even as this dark planet suffers a spiritual water crisis, through your faithfulness, God sent Amazing Facts on a powerful mission of hope to help thousands—including Victor—find true peace and joy! 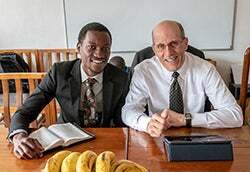 Friend, I knew beyond a shadow of a doubt that God was leading when one of our other meetings was postponed and, at the same time, church leaders in Uganda pleaded with me to do outreach in the capital city of Kampala. Jesus said, “I, if I am lifted up from the earth, will draw all peoples to Myself” (John 12:32). When we lifted up Christ in Uganda, nearly 7,000 seekers came to drink from the Living Water each night! Karen and I witnessed 335 people giving their hearts to Jesus in baptism. And as our AFCOE team continues with follow-up work, we expect many hundreds more lives transformed for Christ. Thank you for making this possible through your gifts! One day, a friend handed Victor a pamphlet advertising health seminars given by our AFCOE Africa students. He decided to sit in on the class, but only as a favor to his friend. He wasn’t interested in anything more. Or so he thought! You see, the more meetings Victor attended, the more the Holy Spirit captivated his heart. He felt the devil’s toxic enticements losing their power over him. He kept coming to drink in Bible truth—and decided to fully surrender his life to Christ! When I met Victor in Kampala, I could see the peace of Jesus in his eyes. He is now preparing to work full-time for God! I also met Francis, a former Pentecostal preacher who accepted the three angels’ messages through Amazing Facts and now desires to teach God’s truths. Many members of parliament and military leaders attended as well. All this was possible only because of your gifts. Thank you for helping us take the Living Water to Africa! I hope the Lord opens your eyes to see the very real, very eternal difference you’ve made. It’s not over, friend. You have helped Amazing Facts broadcast in the past in Uganda, but a transition from analog to digital took us off the air. Countless people begged me, “Amazing Facts needs to be on TV in Uganda!” By God’s grace, a government official attended our meetings and agreed! She is now working to obtain the permits needed to reach into 5.1 million homes in Uganda each month with the three angels’ messages. 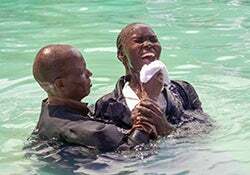 But this international and media ministry can’t succeed without His people, you, being involved. Jesus said, “He who believes in Me … out of his heart will flow rivers of living water” (John 7:38). Will you offer a cup of lifesaving Water to those craving the assurance that only Christ can give? This month, you can help meet our $125,000 international budget to keep our outreach going strong through the Internet and airwaves so, together, we can reach more people like Victor, Francis, and thousands of other parched people with this thirst-quenching truth.